At 3 a.m., the Ohio Union buzzed with murmurs of exhausted students, and tables were littered with dirty plates, power cords and snacks. Angela Rucci stared intensely at her computer screen, trying not to freak out. Her app wasn’t going to be finished in time. Sitting in the Union later that day, her eyes widened reflecting on the stressful memory. The hackathon ended at 10 a.m. 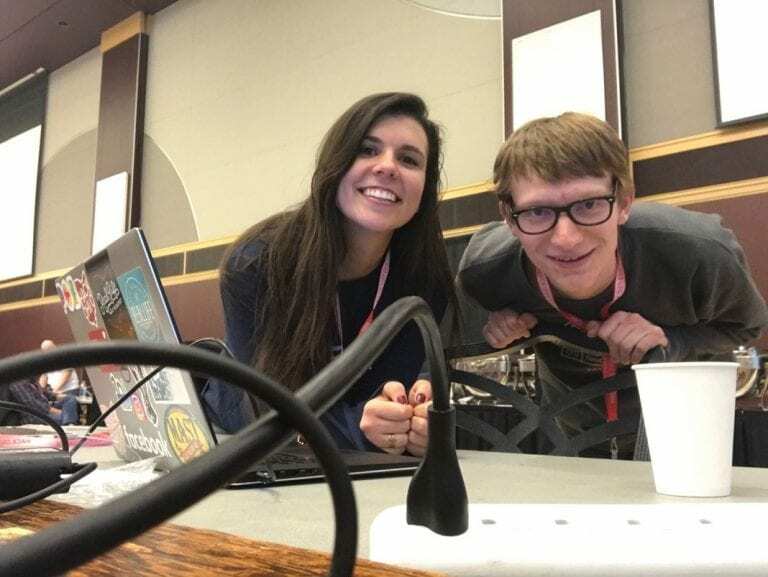 Despite their nail-biting finish at the 2018 Hack OHI/O Hackathon, Rucci, a fifth-year in computer science, and her partner Jared Mitten, a fourth-year in computer science and engineering, won first place for their app, Return Safe. The app tracks users’ locations to ensure they get home safely, alerting a “core group” of friends when the user reaches their preconfirmed destination or veers off route. It also tracks the device’s battery percentage, alerting those core individuals if it dies. “Almost all of the app’s ideas and design came from Angela,” Mitten said. Rucci wrote the iOS app in Swift, a programming language she learned in 24 hours — at the hackathon. This might seem outrageous to some, but Rucci was unfazed. Rucci’s success as a programmer can be attributed to her love of learning. When she was in high school, Rucci’s ACT tutor asked if she had ever considered software engineering. “That was the first time someone had told me they thought I’d be good at something, so I tried it out — and loved it,” she said. Since then, Rucci has spent five years programming. According to her website, she knows more than 11 programming languages. Outside of the classroom, she spends most of her time on personal projects. As a female developer, Rucci said she has encountered stereotypes about women in the computer science field despite her talent and dedication. But Rucci said her passion for technology motivates her to combat stereotypes. One of Rucci’s latest projects focuses on that idea. She’s building a blog where she’ll post YouTube videos of herself presenting coding tutorials. Right now, that project has taken a back seat to further development of Return Safe. Hoping to grow the app into a monetizable product, she’s teamed up with other programmers, including Mitten. Mitten said the two complement each other: Rucci is a talented front-end designer, while Mitten has extensive experience with back-end development. To improve Return Safe, Rucci wants to add emergency services and features that support the user’s mental well-being. The app will track the user’s activity, identify changes in regular patterns and alert core individuals if the user behaves irregularly. Rucci said hackathon judges suggested the app could be useful outside of a college campus environment. “They said they’d use it with their kids, or for an elderly person,” she said. Rucci said she will focus on the app and its potential business after graduation. But for now, she said she’s proud of her ability to successfully balance schoolwork, her internship at JPMorgan Chase and her programming work.